Simon Emmerson: Crossing the Genres. 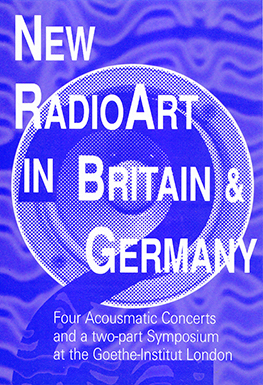 Kersten Glandien: AudioArt as RadioArt – Legacy of an Old Medium. Manfred Mixner (SFB, Berlin): RadioArt – Pratice & Perspectives. Radio as Location. Rachel Baker (Backspace London): Net Radio Days Berlin. Rachel Steward | Martin Spinelli: Engaged Magazine – The Radio Issue. Matt Thompson (Loftus North Productions): The Witness on the Radio: The listening Community.